Sorry for the wait, it took a while to upload. :D The file may take a long time to download, but it's all there! Do you mind if I dl this, too? 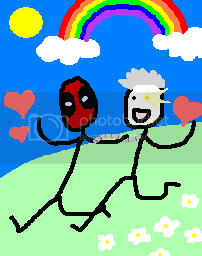 I stumbled over a mention of Deadpool in an Iron Man/Captain America fic, and fell for this pairing when I read the ship_manifesto. That was a few days ago, just enough time to find out that getting my hands on the comics is frustratingly difficult in my country.